DIY Embossed Place Cards — THE FAUX FANCY. Because I'm hosting and because I have a new space and some super pretty new furniture, I plan to set up a cute table scape for Thanksgiving dinner. 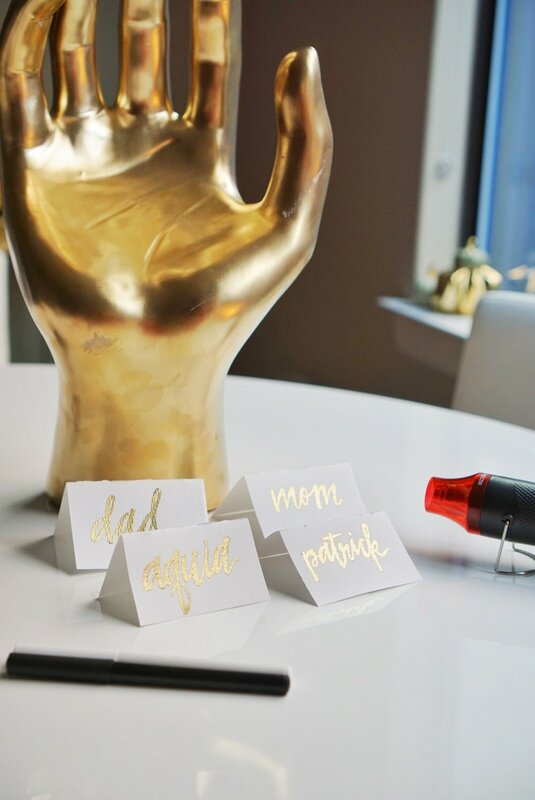 One of small touches to the table will be these super cute gold embossed place cards. I've been wanting to try my hand at embossing for a while (it seemed super simple) so I thought what better time than for the holiday. I spent maybe $25 for everything (if that) and it took me no longer than an hour to make four cards. So, now for the easy part. It's basically like glitter and glue... with an extra step. I chose to freehand, hand letter my place cards, but if you're not confident in your handwriting or hand lettering skills, you can totally print these out with your favorite font. Either way, you simple hand letter (or trace) the name with your embossing marker, then sprinkle embossing powder on top (hence the glitter and glue reference). 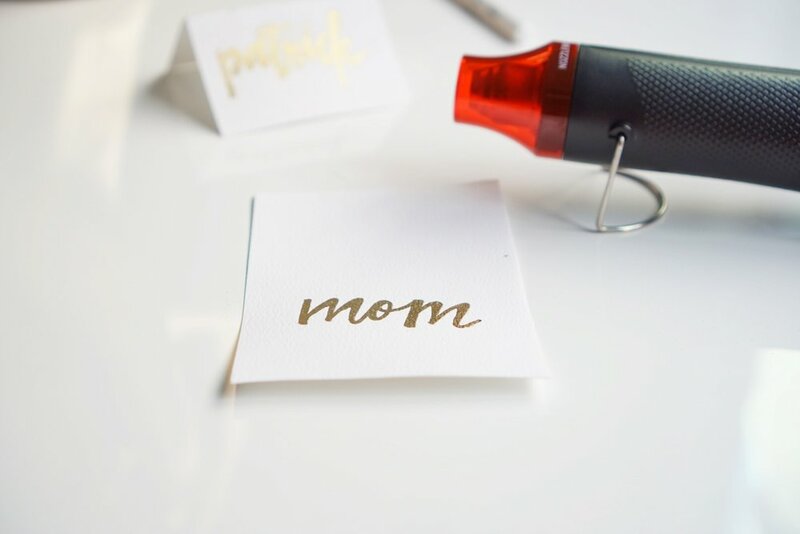 You want to ensure the name/word/phrase is completely covered with embossing powder. Brush off any excess, BUT ensure you don't brush off any powder on the letters. If you do, simply reapply a bit more powder and shake the excess off back into the jar. Once completely covered, you will take your heat tool and hold it close to the surface until you see the metallic finish come through. If you plan to freehand, there are several hand lettering images you can review to try to mimic. If you plan to print and trace, my favorite hand letter-like font is Playlist Script! See the step-by-step instructions below. Easy-peasy! Please snap pics and share if you make these. Wishing you and your families a warm, blessed and happy Thanksgiving!